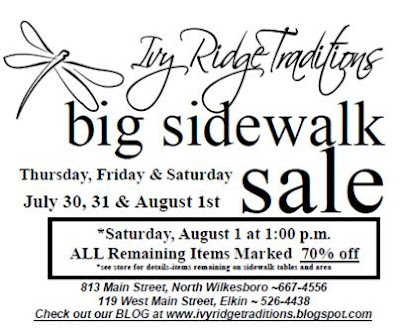 Our Sidewalk Sale continues on Friday and we still have a lot of great items! Huge discounts on Yankee Candle and Beanpods items. 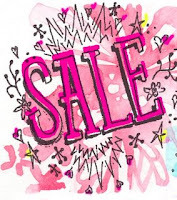 All remaining monogram items are 70% off! Children's clothing is 60% off. The Elkin ship has a special $5.00 children's clothing table. Tons of Crane note cards and stationery on sale! Saturday at 1:00 pm all sale items are 70% off on the sidewalk and outside areas until 5:30 pm! After Saturday, we will pack everything up and donate it to various charities-so don't miss out! Come Monkey Around with Us! We will be receiving new merchandise everyday and today we premiered our super cute new monkeys. These are currently displayed in N. Wilkesboro and will arrive in Elkin on Saturday, August 1st. Pictured above is Daisy, Limeade, and Buttons in the large size. We also have small sizes in Daisy, Limeade and Stripes! A fellow shop owner friend of mine, Kathy, designed these cuties! Don't Miss Our Biggest Sale of the Year! 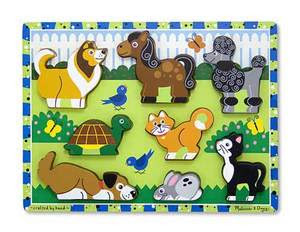 Puzzles, Toys, Games and Stuffed Animals! We got in 38 boxes of classic puzzles, toys, games and large stuffed animals! 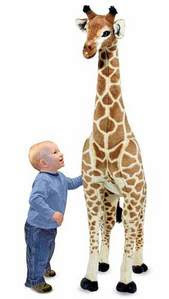 Yes, we have a giraffe at each shop that is 4 feet tall. It is adorable for a toddler's room! Above is a sample of just a few items. We Are Adopting a Hedgehog! 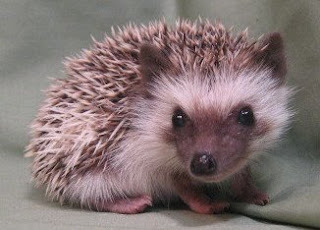 Actually, it is an African Pygmy Hedgehog! We will have to go to Charlotte to get our baby. If it is a boy-we are naming it Briar. A girl will be named Gertrude. We will keep you up to date on our Hedgehog journey! The photo above is not our actual pet, but one of the babies at the Dream Flower Meadow Farm. Quick Trip to Myrtle Beach! Most folks head to the beach for the surf and sun, but not us! We go for the Avett Brothers! Allison and Mackenzie attended their concert at the House of Blues. Allison is a huge Avett Brothers fan. The second photo was made with the actual band when they visited West Wilkes High School during their Merle Festival weekend. You should really check this band out. They are local Charlotte guys, however they appeal to all ages! We also did some shopping and a few other attractions, however we are limited because Mackenzie has just had knee surgery and could not get in the pool or walk more than a few steps. You can see she is in a wheelchair in the photo above. Boy, a wheelchair in crowded public places is a whole other blog topic. 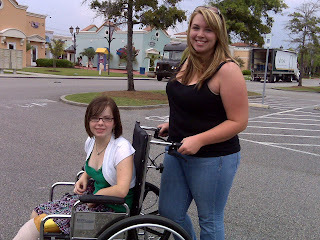 We all have a new respect for folks who have to depend on a wheelchair each day. 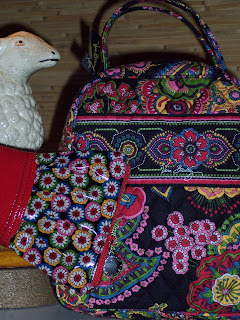 Preview of New Vera Bradley Arriving Around Sept 20th! 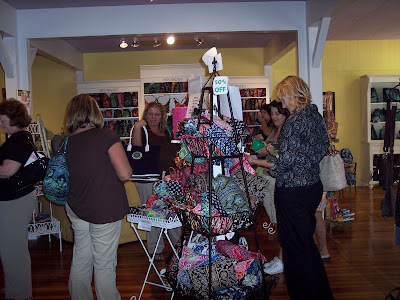 I met with our Vera Bradley sales rep today to place all our orders for the Holiday Collection to begin shipping on September 18th. Above is one of my favorite patterns in the Signature Collection, Symphony in Hue. If you like the new Blue Rhapsody, then the Symphony in Hue will blow you away! I know the economy is still on everyone’s minds and I would love to watch my 401K starting heading in the right direction! 1. Have a yard sale! This would be a great way for some extra spending money during your vacation this summer or to pay for a much needed home repair. 2. The early bird gets the best selection, so start your Christmas shopping before Thanksgiving. By buying early, you can stretch out your holiday budget over several months. 3. Money experts say your car payments should be less than 5% of your family’s pre-tax income. If you have two nice vehicles, consider selling one and buying a used car that you can purchase with cash. 4. Get organized with a grocery list! Go with a list of what is needed for the week and stick to it. Without a list, I find myself coming home with 2 to 3 items that I already had at home, plus this gives you an opportunity to organize and use coupons. Pets are Scared of Thunderstorms Too! After watching the weather tonight, I decided to go with the idea of making your pets comfortable during storms. It looks like we have a 30% chance of storms in our area all week. Does your cat or dog have an animal anxiety attack during a thunderstorm? A pet isn't scared of the flashes of lightning or the boom of thunder like you or I rather it is the feeling of the build up of static electricity on their hair. Use a dryer sheet to help your family pet to ease their thunderstorm phobias. Simply, rub a dryer sheet on your pet's coat to remove the static electricity to help reduce or eliminate their discomfort. Keep in mind I am no pet expert rather I like to share tips of interest. I have been told this only works about 50% of the time, however it could be a pet to person bonding experience-not to mention your pet will smell better! New Baby Stuff for Boys and Girls! We got a great shipment of four different baby color collections for Ivy's Child. All four collections each have a great baby travel pillow (first picture). These are a great unique gift. Don't you hate to see a little one asleep in their carrier or car seat in an uncomfortable position. This little pillow keeps our little ones comfortable. Also arriving today-blankets, safety blankets, musical pull toys, and onsie sets. However, out of everything we unpacked I love the crazy dolls (second picture-Olivia doll) for our girls...don't you think we all need a crazy doll? She has a warm sweet smile! 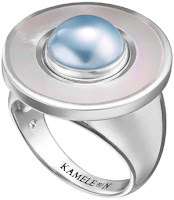 New Kameleon Fall Jewel Pops & Jewelry Has Arrived! The new fall releases include new pearlized jewelry (ring shown) in a ring, pendant, and bracelet and several new jewel pops including a new monogram silver pop collection. There are also some different colored pearls as well as some new bling pops! Each shop received their own shipment, so stop by the nearest location to get a great selection early. Great New Way to Water Your Dog! Now you can water your pet without worrying about finding water and carrying around a bowl. 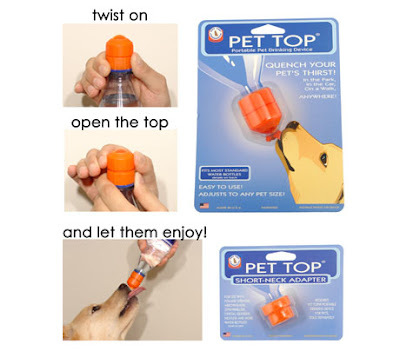 Just add this topper to most water bottles and tip it down for your dog to drink. You don't squeeze it rather all the dog has to do is lick! I am 100% positive Ashley, our Elkin shop manager, will purchase one ASAP for her dog, Max. We already have one at home for our dog, Josie! Retail: $8.99 and available at both locations! Tweet with Me! I Have a New Twitter Name! 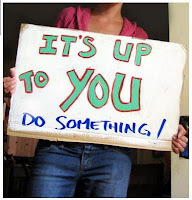 Come on and TWEET with me! I know that every few minutes someone on television is talking about Twitter, so I could not help myself, but to go exploring on the web! One great benefit about Twitter is the flow of information you can receive when you follow people who share your interests. I am following several retail specialists, Martha Stewart, Oprah and a few people who tweet healthy hints and recipes, so it is entertaining! It is all about the little stuff in life summed up in 140 characters. I just changed my twitter name to shopivyridge! 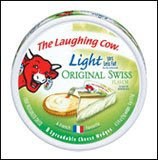 As many of you know I am trying to eat healthier and I can use Light Laughing Cow Cheese hundreds of ways! You can find it in the deli cheese section of your supermarket. It is 35 calories per wedge and 1 WW point! 1. Spread it on a tortilla with turkey or ham, roll it and cut it for pinwheel snacks. 2. Mix balsamic vingar with your favorite flavor and eat with crackers. 3. Use with an english muffin and tomato and broil it and sprinkle with green onions. 4. It is super on a cucumber sandwich! 5. Put a wedge inside a 93% hamburger pattie before cooking. RS Covenant Rings Are Restocked in NW Shop! Yes, we are back in stock with most of the sizes (5-10) in all our rings. There is not enough blog space in this little post to list all the good things about RS Covenant Rings! They are both sterling silver and fashion jewelry, however the company offers an unconditional guarantee on each piece. Unconditional!!! Straight from their website: If, for any reason, a customer isn’t completely satisfied with our product they can return it to us, as stated on the guarantee form, and we will repair or replace it at no charge. They also use great quality stones as well. When you are in the NW shop look for a glass box with a pyramid of rings, all the rings are sealed in the case. You just ask one of us and we have all the sizes in a storage case by the gift wrap on the counter. Right now we just sell RS Covenant in our North Wilkesboro location, however we are hoping to add them to our Elkin shop soon. The Thrill of the Frill! The Frill Collection is latest Vera Bradley introduction that is unlike none before! It is made of laminated fabric both inside and out. Honestly, this collection was sold out with 3 days when it was opened up for retailers to purchase during the early ordering period. If you are interested in any of these bags, I would encourage you to buy it now. We are not able to reorder any of the items. We actually received less than we ordered due to the high demand across the country. The hardest thing for us at the shops is keeping up with the cool names of these bags such as LYLAS (love ya like a sis) or FOFL (fall on the floor laughing). Be sure to stop by and check them out! And Our Sale Goes On! Our Sale Night Premiere was a success in both stores. We were excited to have people waiting at both shops when the doors opened. In North Wilkesboro, we had an exciting afternoon, because our computer was down. Double Edge Technologies were nice enough to stop everything and help us get it going again. The computer was fixed at 5:45 pm-15 minutes before we opened! AND MUCH MORE! Stop by! Yes, we all attended the Harry Potter and the Half-Blood Prince Midnight Premiere in Boone. The girls wanted to go and exactly asked Alan and I to go with them. Hey, since when do teenagers ask their old parents to do anything with them- so off we all went! Left at 10:30 pm and returned home between 3:30-4:00 am. Can you believe the photo above of the crowd? When we left the theatre after the movie almost all the spaces in the large parking lot in front of Big Lots and Lowes Food were full. How was the movie? I thought it was a little slow and the humor not so funny, however Allison enjoyed every minute of it. As for me and the late night showing-sadly I took a little nap during the last 20 minutes and missed the exciting parts. I was upset that my family had not poked me awake. Luckily, I read the book and exactly remembered most of it. There is no substitute for reading! Happy Graduation, Allison & Torey! I know this is late, but I do not want to leave it out, because these girls have worked to hard! Yes, Allison, our oldest daughter, is actually old enough to graduate from West Wilkes High School! It seems like only yesterday that she was splashing in the rain with her Barney raincoat and umbrella. Allison is purposing a career in zoology. She has a special gift in working with animals and their care. She currently works at White Oak Staples providing riding lessons and horse camps for children. We are so proud of her and know she will make the world a better place with her kind heart! Congratulations to Torey Sheets! 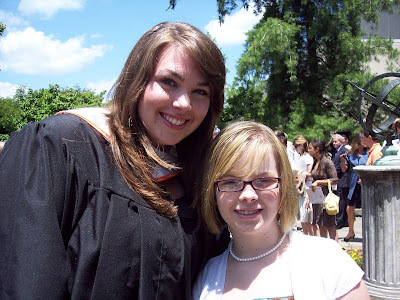 Torey graduated from The University of North Carolina at Chapel Hill with a Bachelor of Arts. Torey is the daughter of Sandy Sheets, who is part of the Ivy Ridge staff at our North Wilkesboro shop. Torey is working towards a career in the medical field. We see her has Dr. Torey Sheets in our Ivy Ridge crystal ball! Torey has volunteered in Africa and other various mission teams and has a strong desire to help others. Picture: Allison and our youngest daughter, Mackenzie, after WWHS graduation at the Walker Center. Final Atlanta Update-New Woodwick Candle Cabinet in NW! One final Atlanta update...We are excited to add a complete Woodwick Candle Cabinet in our shop in North Wilkesboro. We will have medium and small jars, Fusion Glass candles, small reed diffusers, new spill-proof large diffusers and wax wafers in 32 fragrances. We will be fully instock with Cinnamon Chai!!! This should be arriving soon and we will be changing our candle area dramatically after our Summer Sale! Just Say No to Plastic! 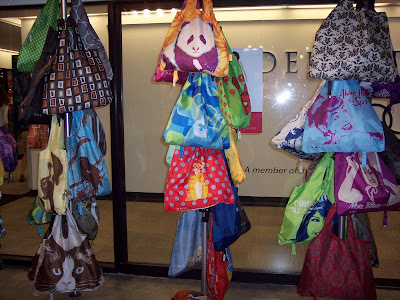 This was our last day in Atlanta and we found these great new eco-friendly bags that fuse fashion, function, and heartfelt environmental concerns for our planet all together! 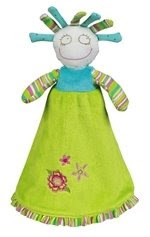 Great to send your child's favorite blanket to daycare or for your shopping needs! We are hoping to create our own trees of bags in both shops! These are shipping ASAP! 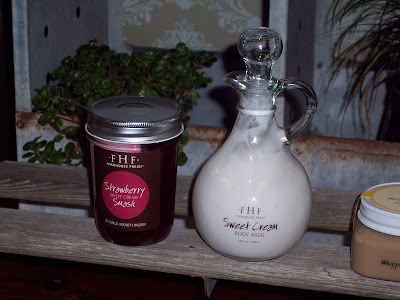 Farmhouse Fresh Personal Care Products-Oprah Loves the Foot Scrub, We Loved the Whole Line! In all of our experience having different bath & body lines, I have NEVER seen a line that I love so much. Oprah using the foot scrub, however we did not even know that little fact until we had began to order it. In my photo you can see the Strawberry Smash Double Moisturizer with aloe and live Strawberry Cells. Second is the Sweet Cream Body Milk infused with a blend of natural oils: Rice Bran, Jojoba, Sweet Almond, Avocade and Sesame. I love the glass cruet! This will be arriving in just a couple of weeks! 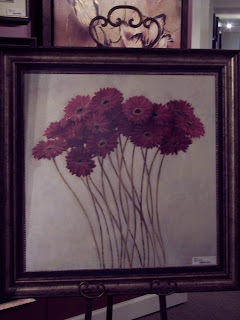 Waxing Poetic-Our Best Find of the Show! They started with initials to honor those who gave us names to match the letters. And then they kept going. Why only letters? Why stop? Amulets, symbols, precious things to carry, zodiac signs, small treasures - these charms tell a story, a personal one and allows you to share your family symbols with others. Language makes us human. Love and naming ties us all together. Letters, symbols, and signs help tell our stories. We're honored to help you tell yours. 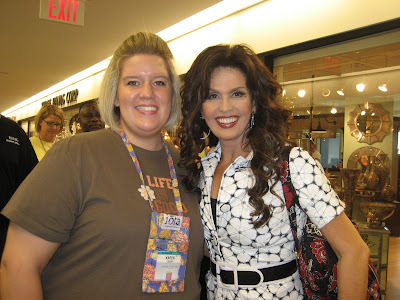 We are now Marie Osmond fans!!! Yes, believe it! Marie was at the mart and she was so nice! Here are Karen and Marie making friends! Amazing Crosses! A True Piece of Art! These crosses are so beautiful. They are layered with colors on top of colors. We will have wall art, notecards and 3 different t-shirts. Please note this photo is not great certainly not because of the artist rather because of the poor photographer, Me! These will be arriving shortly. 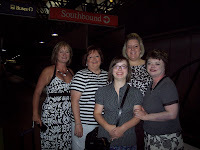 Photo (left to right): Karie, Connie, Mackenzie (my daughter), Karen (Connie's daughter) and myself (Angela). Sorry I am missing Karie's daughter, Laura, who graciously took the photo. A buyng trip to Atlanta would never be the same without my other shop buddies, Karie and Connie. It worked out that all our daughters could also attend with us, since it is summer. Mackenzie and Laura are out of school and Karen, who teaches, is also home for the summer. Picture, Picture on the Wall! We always have empty spots on our walls, so we needed a few more prints. They will be arriving in 4 to 6 weeks. We wanted to show you our favorite one which has gerber daisies in a beautiful shade a eggplant purple (purple is certainly an Ivy Ridge color)! This is a very large piece and will have an amazing impact in a large room. The retail will be around $219.99 depending on the amount of freight to ship it to the shop. We will post more tomorrow-two more days to go! Dancing Daisies! Yes, We Did Buy Them! This is my first video on the blog...so I am hoping this works! These are the cutest dancing daisies. Every little girl should have one and the best part it is requires no batteries. It is solar! I know this seems like a goofy thing to post about, however you would not believe however many people were stopping and smiling at these flowers! I only wish I had any enough computer knowledge add music to my video so they would really be rocking out! Many of our customers will be familiar with this company: Natural Life. We have had some great items from them in the past, however they had tons of new stuff that will make great stocking stuffers and gifts for Christmas. Scarves are the "in thing" and we loved these scarves, so much that we got all these cool designs. These will have a $21.99 retail, however they are really a great length and the designs have great details! We started our morning off with a great find in these Bella ecofriendly bags. Like Bella says-the new reusable "It Bags." They are cheap and chic! 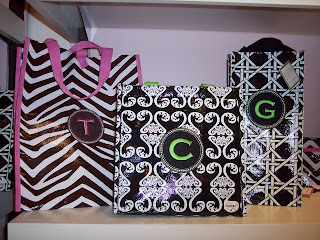 You pick your bags and we will have monogram patches you can purchase in matching colors to add to it. Bags will retail from around $7.99 to $24.99 plus the addition of a $5.99 patch. Who knew that saving the planet could look so good??!! Macaroni Mania at the OK Cafe! We made it! Our drive down was long and we ran into a ton of rain in Georgia to the point we had to pull our little Honda Civic Hybrid over for a break. All the big trucks were blowing by us in rain so hard you could barely see the road! However, let’s get on with the great food we discovered. We ate dinner at the OK Café which claims to be an “Atlanta phenomenon.” Well, in my ten years of visiting Atlanta, I was not aware that such amazing triple cheese macaroni existed in this world! 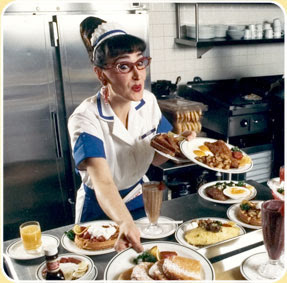 And yes, the waitresses in the café really do wear that cute outfit and have a true southern charm. The OK Care has been touted in such great publications as SOUTHERN LIVING, FORBES AND LADIES HOME JOURNAL, however now they have really made it to the big time with our IVYRIDGE BLOG! Don't you agree! Heading to Atlanta! Stay Tuned! 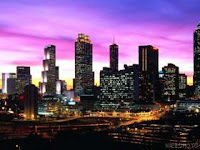 Mackenzie and I are off to Hotalanta (aka Atlanta)! We are going on our fall buying trip for the shop. 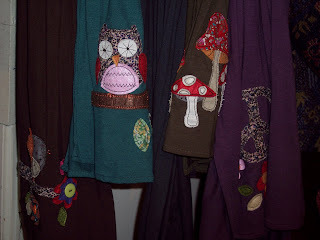 I am going to try my best to post some pictures every evening of our shopping finds and adventures! I will be seeing a lot of old friends. We are staying with two of my very best girlfriends and their daughters. We all have been friends for years and share shop secrets with each other. 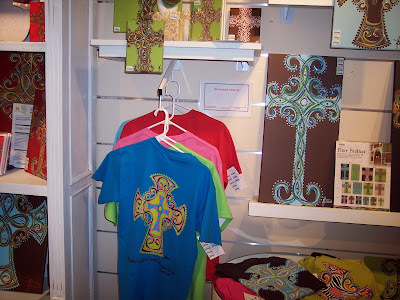 Connie has a jewelry, gift and floral shop in Taylorsville, Mississippi and Karie has a gift and home decor shop in Signal Mountain, Tennessee. I will also post a few pictures of our evening adventures together as well. July 2009 Blog Buddies Coupon! Yes, we are going to add a special coupon monthly for our blog readers as a thank you for following along in our world! Please print the above image and bring it in the shop. You are welcome to right clip on the coupon and save it to a Word document to save ink and for ease of printing. Hey, Blog Readers, you are the first to know about our secret sale plans! 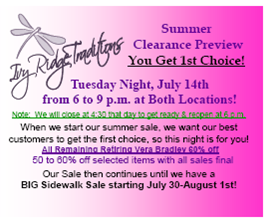 We are starting our Sizzling Summer Sale with a special in-store event on July 14th from 6 to 9 pm. 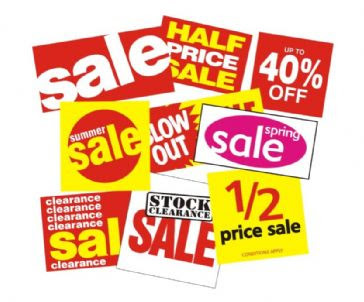 We are inviting our regular customers to come in and shop first to get the best deals before we open the sale to the general public and run our newspaper ads. Consider this a special invitation to join us at either our North Wilkesboro shop or Elkin location. Hey-why not go to both...different sale merchandise at each location. The sale will then continue and end with a big sidewalk sale with even more discounts on July 30, 31 and August 1st. When: Tuesday, July 14th from 6:00 to 9:00 p.m. I worked as a Membership Director for the Girl Scouts, Tarheel Triad Council for 8 years. During the summer as you can imagine, I was working with a lot of children in all my summer programs. This is a quick, easy idea to entertain children that is FUN! Gather cotton string (yarn) and straws to make wands. Cut two sections of straws, about 6 inches long. Cut a string about 24 inches long. Pull the string through the straws, tie the string in a knot, and hide the knot inside a straw. 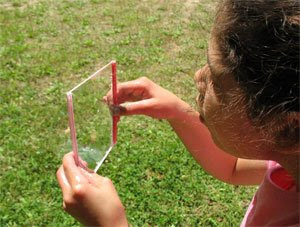 By putting your hands on the straws and pulling, you create a square or rectangle. Dip this form into the pan of bubble solution, and gently, but quickly draw it through the air. It is like magic....a giant bubble! Crystal Rainbows! Just Arrived Today! We have had so many requests that we have again added the Crystal Rainbows ($79.99 retail price) to our inventory. We received Dark Brown and Black today in the North Wilkesboro shop. The Expresso Brown in the Crystals did backorder, however Rainbow will hopefully send them soon. I am going to get myself a pair. I love them-comfort and bling! What more could a girl want? Elkin Party Was a Blast! More Elkin Fun on the 4th!